Four assorted fabric sew on badges. This lovely lot consists of. Grab yourself a piece of rock history! Rush Pin Badge Old Skool . Condition is Like New. Dispatched with Royal Mail 2nd Class Large Letter. NEW WORLD MAN / COUNTDOWN. 'Made In England' stamped on the back of the badge. 2,"RUSH 2112 ". 1, "RUSH ". size 35mm. size 25mm. In very good condition for it's age. 'Made In England' embossed on back of badge. In very good condition. 'Made In England' stamped on the back of the badge. In very good condition for it's age. Light tarnishing to reverse side. Made in England on back. Grab yourself a piece of rock history! 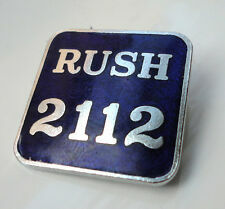 2,"RUSH 2112 ". 1, "RUSH ". size 35mm. size 25mm. Made In England stamped on the back.